For over 60 years, we have provided quality rental and custom backdrops, theatrical equipment and supplies to the performing arts and entertainment industry. Our client base is large and diverse ranging from industrial giants to small non-profits, theaters, universities, schools, dance companies, churches, displays, trade shows, festivals, museums and individual special events. 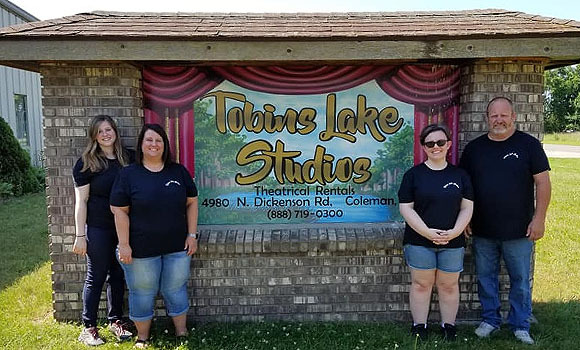 As a full service entertainment provider, Tobins Lake Studio offers personalized consultations, custom design and event management services for theatrical, academic and historical venues. We provide rental stage backdrops, armor, ornaments and draperies. Tobins Lake Studios Inc, was incorporated in 1952 as a theatrical production company, providing scenery and lighting for theatre and trade show events. Numerous requests for backdrops made the founder, Robert Mellencamp, decide to develop inventory specifically for the rental customer. Tobins Lake Studios was one of the first companies to offer this service to the performing arts industry. Emma Mellencamp, Robert’s wife was a notable costume designer of the time. One of her passions was period Armor. Mr. Mellencamp and his very talented team at Tobins Lake Studios came up with Idea of creating Armor out of plastic. A custom vacuum machine was designed and built, molds were sculpted and the first vacuum formed products were produced for the theatre. You may still be able to dust off an old Parker & Smith theatre desk reference and find a discussion of that first entrance into the theatre. In 1980 Mr. Mellencamp retired and sold the corporation to the current owner Daniel Willoughby. Mr Willoughby, a professional lighting designer with a degree in theatre arts picked up the torch and proceeded to add to the already significant inventory of scenic art. He also developed a lighting production company that grew and was eventually incorporated and separated from Tobins Lake Studios in 1997. Thanks to a very loyal customer base Tobins Lake Studios continues to thrive, adding new backdrops and draperies every year. Our love of the art form and our passion for quality customer service will always be part of our signature. We have hundreds of backdrops painted with well known plays in mind. All, with our ability to ship directly to your door. We have a wide selection of rental draperies made out of velour and other specialty fabrics. Some of the draperies are available in large sizes up 32’ tall. Our light weight vacuum formed plastic for Stage and Film sold in an unfinished state for you to adapt for your specific production.